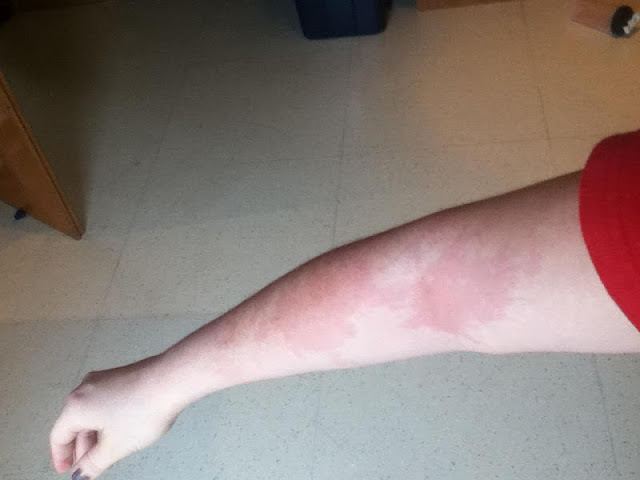 mariasimoneidejhs: The Story of How I Burned My Arm + A WARNING! WARNING: Cleaning with vinegar could be dangerous. I learned this the hard way. This is the story of how I burned my arm cleaning with vinegar. Not long ago I decided to clean my microwave. The usual way I do this is to take my 2 cup glass measuring cup and put some water in it, nuk it for a little while, and let the steam loosen the gunk. Then I wipe it clean, done. I had heard that adding vinegar to the water would help get rid of any odors so I thought, why not, I'll give it a try. Bad idea. Like usual, I put some water in my measuring cup, then I added in a little vinegar and started microwaving it. (I think I set it to 2 minutes maybe). After the timer went off I opened the door and took the water out. Just as I got out it popped (like exploded is more like it) and splashed the scalding water/vinegar all over my arm (and even on my face). It was lucky that Ariana wasn't right there because I screamed and threw the measuring cup down. It started burning so I ran it under some water. I started turning a bright red and you could see where the splash landed. It wasn't pretty. I had planned to go out with some girlfriends that night for a dinner and a movie for a rare girls night out. But since I burned my arm less than 2 hours before I was suppose to meet them, I had to cancel and stay in. I put aloe gel on it and wrapped it up. Took some pain relievers and had a glass of wine and the pain subsided. I have never heard of vinegar and water causing a weird reaction like this when microwaved. In fact I had read here, here, here, here, and here (to name a few) that it was a good cleaning method. None of them had a caution warning. I don't know if this has happened to anybody else or not, but it happened to me so I'm sharing this story. Please be careful. Please share this information with others. The photo above was taken 4 hours after it happened. Luckily for me my arm has healed pretty well. My skin was red for a while and then a month later it finally peeled and healed completely and you can barely see where it was now.